It’s that time of year for the Halloween decor to come out and grace your October tablescapes with the fun of the season. 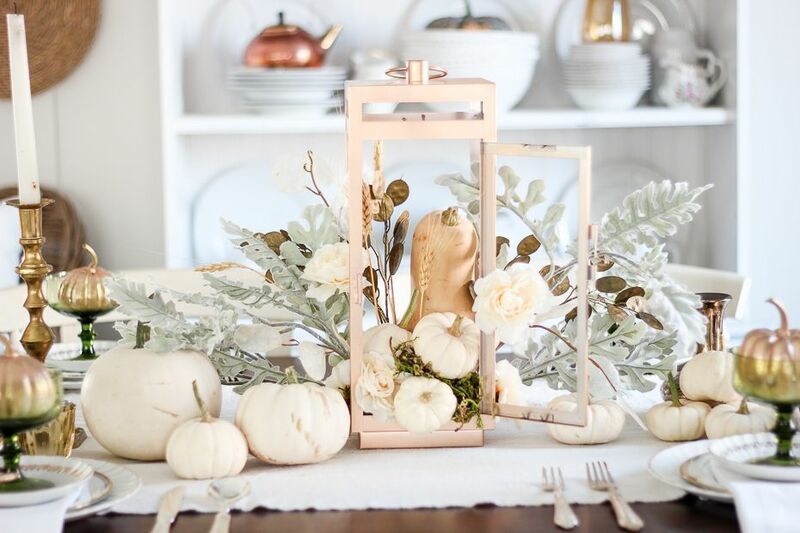 There’s an October tablescape style to suit every decor and budget and we’d like to present a few design ideas for your own unique October tablescape. Here’s a look at some stylish inspiration. Touches of gold in the plate warmers and the flatware delicately enhance the bold black and white stripes of the tablecloth for this October tablescape. The cheer of this setting is in the myriad of crystal and glass pillars of different shapes that hold soft neutral candles. These are surrounded by several sizes of white pumpkins to add the touch of the season to this unique Halloween tablescape. If you prefer a neutral look try this delightful style. Decorate with a centerpiece that features white pumpkins with sprigs of natural, fresh and dried plants and flowers. Mix and match white china with gold rims come alive with brass candlesticks close by. A touch of whimsy is added with the small brass colored pumpkins in the smokey green dessert goblet. With so many interesting textures, this October tablescape is bright and alive. We don’t want to leave out the traditional black and orange as inspiration. 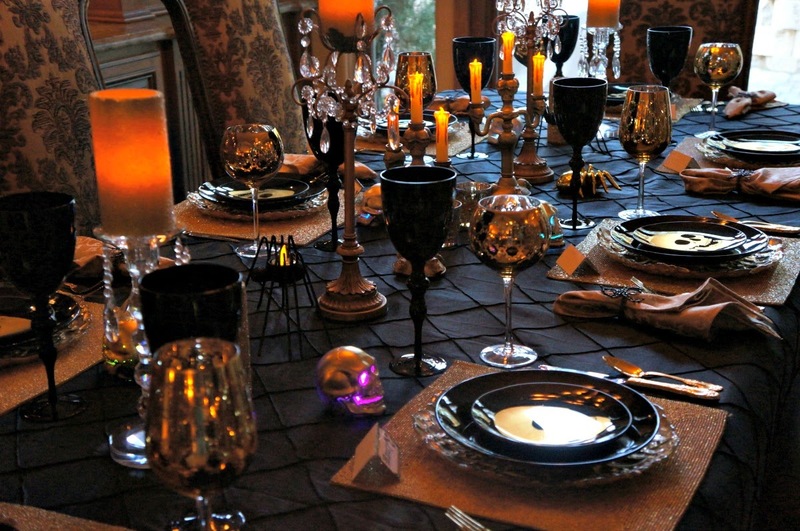 Shout out the spirit of Halloween with the black linen tablecloth, stemware and place settings. Halloween orange pops on placemats that glitter and in candles all around. Shiny accents sparkle on the gold gilded stemware and the brass table decor. With the reddish-amber glow of the multitude of candles, this October tablescape is warm, festive, and just a little spooky. Your October tablescape doesn’t have to be spooky to be entertaining. Consider this modern color palette of deep purple and bright green for a fresh non-traditional seasonal look. The Chiavari chairs are elegantly wrapped with an organza chair sash. Then, add a bright green rosette table runner for a chic Halloween table. It is our wish that with a little bit of inspiration and ingenuity, you find the exact style you desire to entertain your family and guests for the most fun and memorable events.